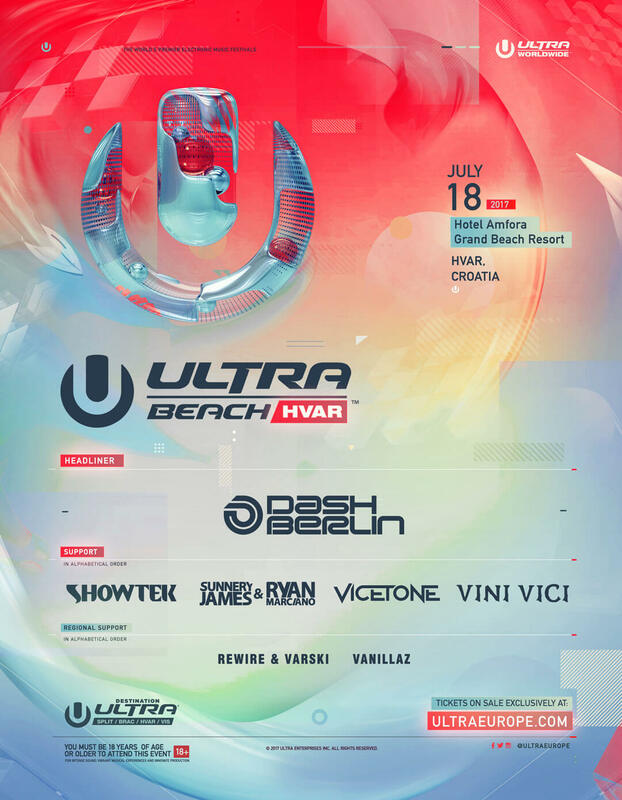 ULTRA Beach Hvar, ‘the greatest pool party on earth’ (The Sun – 2017), has announced the lineup for this summer’s edition, with superstar Dash Berlin taking up headline duties for the very first time. The Dutch progressive house and trance legend will be making his ULTRA Beach debut, and will perform at no other event during the Destination ULTRA week. Showtek, Sunnery James & Ryan Marciano, Vini Vici, and Vicetone will provide the support alongside local acts Rewire & Varski and Vanillaz. Taking place on July 18, the event will return to the Hotel Amfora Grand Beach Resort on the shores of the idyllic Croatian island of Hvar. An expected 5,000 revellers will attend, intent on soaking up the sunshine whilst submerged in crystal blue pool waters at one of the go-to events of the international festival calendar. Tickets for ULTRA Beach Hvar are available for €99 exclusively at UltraEurope.com/tickets/ultra-beach. The internationally renowned festival, which has taken place every March since its inception, celebrated its nineteenth anniversary on March 24-26, 2017 by bringing over 165,000 music enthusiasts to the sold out waterfront event in the heart of the City of Miami. Ultra Music Festival®, recently voted the world’s #1 Festival by DJ Mag for the second consecutive year, returns to Bayfront Park for its twentieth annual edition on March 23-25, 2018. Over the past nineteen years, thousands of the world’s most iconic DJs, producers and live acts have mesmerized audiences with awe-inspiring sets at ULTRA festivals in ARGENTINA, BALI, BRASIL, CHILE, CROATIA, IBIZA, JAPAN, KOREA, SINGAPORE, SOUTH AFRICA and of course MIAMI, as well as ROAD TO ULTRA® events in BOLIVIA, CHILE, COLOMBIA, HONG KONG, JAPAN, KOREA, MACAU, PARAGUAY, PERU, THE PHILIPPINES, PUERTO RICO, SINGAPORE, TAIWAN, THAILAND and the USA. Each new global edition has been founded on the same successful recipe that has been perfected over nineteen years in Miami, combining the most diverse electronic talent with the most technologically advanced, large-scale festival productions in the world. The ULTRA brands have pioneered the live stream experience with ‘ULTRA LIVE’ (with over 650 million live stream and recorded set views from Ultra Music Festival Miami since 2013) and the audio broadcasting platform ‘UMF RADIO’ (syndicated to FM Radio in over 62 countries and reaching more than 22 million listeners weekly). Also UMF FILMS’ collaboration with FINAL KID has seen some of the most visually breathtaking festival aftermovies in the music space, including a feature-length documentary exploring the explosion of dance music, entitled CAN U FEEL IT™, which was premiered on the red carpet at the Klipsch Amphitheater in Miami in 2012 and was exhibited in over 500 theaters across the Unites States. 2016 and 2017 have seen the ULTRA and ULTRA WORLDWIDE™ brands continue to push the boundaries even further, bringing an unparalleled combination of cutting edge productions and the world’s best electronic acts back to previous strongholds and new frontiers across the globe. With the SOLD-OUT edition of ULTRA Brasil®, ULTRA Singapore™ having become a full scale two-day festival, RESISTANCE’s debut standalone South America Tour, and the debut of ROAD TO ULTRA®’s Hong Kong, 2016 was the brand’s most successful year to date. A RESISTANCE summer residency at Privilege Ibiza is confirmed for 2017, while ULTRA China will debut in Shanghai on September 9-10, 2017. Also in 2017, two ROAD TO ULTRA® events will take place in New Delhi and India. ULTRA® have revealed further expansion into Australia for 2018. The ULTRA brand will be present in at least TWENTY-THREE COUNTRIES across SIX CONTINENTS worldwide by the end of 2018.